Never mind the movies, the shortlist for the ‘Oscars’ of the British coach tourism industry has been announced, and it’s great news for a West Country-based business. Bakers Dolphin has been shortlisted in four categories for the prestigious British Coach Tourism Awards 2019. The firm, which celebrates its 130th anniversary in 2019, has once again been shortlisted in the category of Coach Tour Operator of the Year (Large Fleet), a title it won in 2018. Bakers Dolphin, which is based in Weston-super-Mare, has also been shortlisted in the Holiday Programme of the Year, Day Excursion Programme of the Year and Coach Tour Professional of the Year categories. The winners will be announced at a glittering gala at the National Motorcycle Museum in Birmingham on Wednesday 20 March. Now in their 14th year, the awards are judged by a panel of industry experts against very strict criteria, who aim to recognise and highlight examples of best practice, honour those who go the extra mile and celebrate the very best in the business. Max Fletcher, Managing Director of Bakers Dolphin, said: “We’re extremely proud to have been shortlisted in four categories of this top awards once again. “Last year we were shortlisted in four categories and came away with two awards. It would be wonderful to win something again this year, especially as we celebrate an anniversary of our own, 130 years in business. 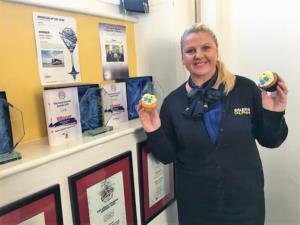 Kate Bastin has been shortlisted for Coach Tourism Professional of the Year, after reaching her own milestone in 2018, when she celebrated 25 years with the business. Kate, currently Contracts Manager for the firm, joined Bakers Dolphin after her father spotted an advertisement for an admin assistant for the company’s London Flyer Service. It’s ironic that she has enjoyed a career at a firm which has family values at its core, because she has an unusual family link herself. The first home her parents moved into after getting married (long before Kate came along) was a bedsit in a house in Weston-super-Mare. Today that bedsit is the operations room of Bakers Dolphin, which has been based in that house for more than 50 years. Amanda Harrington, Sales & Marketing Director for Bakers Dolphin, said: “I am particularly pleased that Kate has been shortlisted for an award this year. “She has become a vital member of the Bakers Dolphin team, and really does go the extra mile. “She is always smiling and regularly goes above and beyond in order to provide the best possible service for our customers.